Well, perhaps toy isn't the best word for this one. 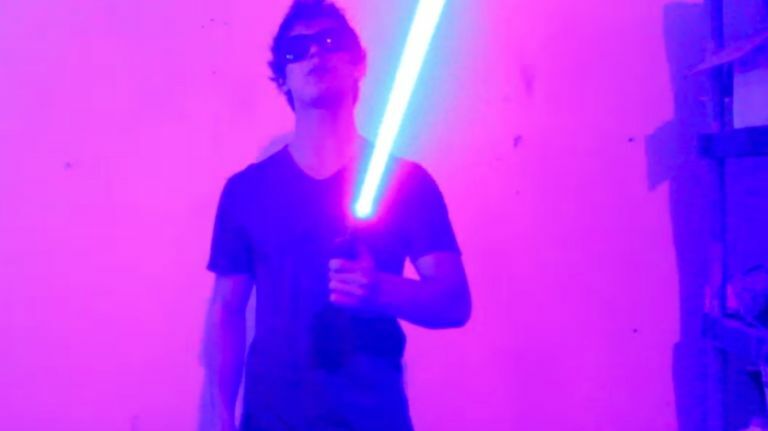 This dream gadget is no light-up, telescopic replica weapon you see children and grown men playing with outside cinemas - this homemade nerdgasm is about as close as it's possible to get to a real-life energy blade, and that means it's just as dangerous, too. Of course, it's theoretically impossible (at the moment) to create a blade comprised of pure, controlled energy, creator Styropyro's version instead uses a heavily upgraded 7W blue laser that's so powerful it could blind you in a flash. In fact, it's so powerful it burn through wiring and other household objects with ease. So unless you've passed your Jedi training with flying colours, we'd advise you avoid trying to build one yourself. Want more homemade potential disasters? The same creator is teasing another DIY laser bazooka. Yes, dear reader, you just read the words 'laser' and 'bazooka'. We can't believe it either. Apparently the monstrous creation will create multiple 40W lasers to create, well, something akin to the Death Star's superlaser we imagine.